Made this cake and frosted the entire cake with mousse instead of leaving sides bare. Everyone absolutely loved it!! I’ll definitely make it again. It would be perfect for Thanksgiving too. Thanks! I know this is old, but my family loved this! They especially loved the mousse instead of frosting idea. I want to make the mousse but a peanut butter version. I I sub peanut butter for caramel, I assume you’d up the sugar? By a cup? Thoughts? Since I wanted it to be pie filling, I used less cool whip but you should use the 16 oz of cool whip so that it is light and airy. I would like to go the heavy whipping cream route. How much do you suggest I use (size bottle)? A whipping cream recipe wouldbe nice though! Start by chilling the bowl and beaters. Beat the heavy whipping cream until it starts to thicken. Could you use sugared apples instead of pecans or no? 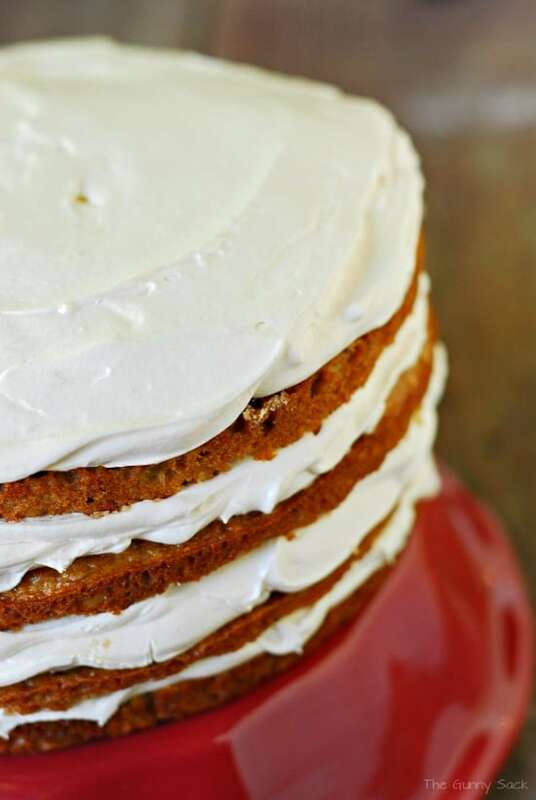 Yes, you can top the cake with whatever you want. If by sugared apples, you mean something like apple pie filling, you might want to add it right before serving so that the liquid doesn’t soften the caramel mousse too much. I have made this so much I can do it by memory just about. Delicious, most requested. Won a contest at school with it. For those having trouble with Caramel use dip not ice cream topping. I’ve even made it just with two layers and no complaints from recipients. I use gala or honey crisp apples and only one good size. I made this for Thanksgiving and it turned out perfect and was delicious. The only change I made was to bake the cake in 4 pans instead of 2 because I was nervous about splitting the layers. It was definitely a hit and will make again. If you’re a bit nervous about doing all the diff layers, could you try in a 9×13 baking dish? Yes, you can make it in a 9×13. Follow the baking time on the box. Also, you will not need all of the caramel mousse. What type of Apple’s do you use? Looks so good, can’t wait to make one! I followed the instructions exactly as stated but when I put the cake together it fell apart into a big blob. Has anyone else had this problem with the mousse filling? I am sure it will taste good but it is a disaster. I am very disappointed. you need to add some corn starch/flour to your store bought caramel and put it on the store to simmer and thicken, that’s what I do. I have a question regarding the bake time. Is it 25-30 min for a 8 inch cake pan? It would be less for a 9 inch cake pan right? I want to make this tomorrow if possible and wanted to double check. Thanks! I made this cake yesterday and it was delicious I didn’t change a thing exept that I shredded the apples after I peeled them because one of my boys don’t like the feel of chunks of fruit in desserts and that I didn’t used all the icing. I had trouble on making the slices even so next time I’ll bake it in 8 inch 4 round cake pans. My family loved it, thanks very much for sharing it with all of us. This is a wonderfully delicious recipe. I am making it again, but modifying it a bit to suit my taste. I’m omitting the confectioner’s sugar altogether, as it’s a bit sweet for me. I’m thinking the caramel sauce and whipped topping will be sufficient for sweetness. Further, I’m doubling the spice cake to 8 slabs (after slicing), as I prefer just a little mousse on each layer. Lastly, I will purchase two(2) containers of the Marzetti dip to ensure that I have enough for the decorative “spillover” down the sides. We’ll see how this turns out. Either way, I will definitely look for your new additions. You sold me with this recipe! I make this cake again with the modifications described above. Just for the fun of it, I stacked all eight(8) layers into one vertical cake and took it to our annual choir Christmas party. It was a beautiful display, although a bit unwieldy to cut and serve. One friend who had a slice from the original recipe and one from my modified recipe found mine better tasting to her. It is not a competition for votes, however. It is simply a recognition of how much “sweet taste” different people react to. We also both agreed that this cake is yummy a day or two later, straight from the refrigerator. I’m going to make this again soon, but I’ll split it into two cakes, rather than do the “eight layer stack-up”. I won’t have any trouble deciding what to do with the two cakes. Giving one of these cakes will make a friend for life! Just a little tip in cutting the cake layer in half, I used dental floss string and sawed it back and forth pulling towards me with the cake flat. This worked great, I only had 9in cake pans and thought it would be impossible to slice these layers with a knife so I just went with the floss and it worked really well. You will need to wedge the cake plate against something while sawing the layer in half with the floss. Hi! 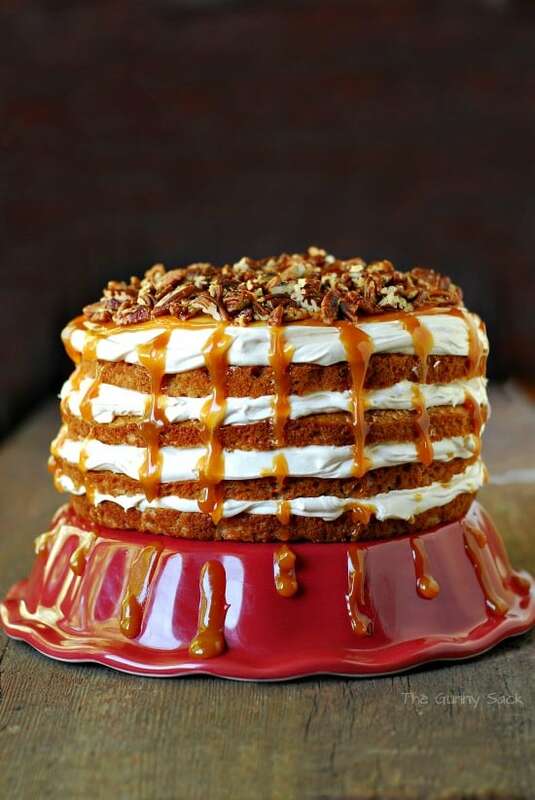 I made this cake in 2014 for my Thanksgiving feast and it was so AMAZING, that I’m making it again this year. Thank you for the great idea and the easy to follow instructions. I can’t wait to share it on my own blog. I’ll definitely link back to your page…your recipes are too good not to check out. Can’t wait to try more of them! can you make the mousse ahead of time and assemble later? Hi Tonia! 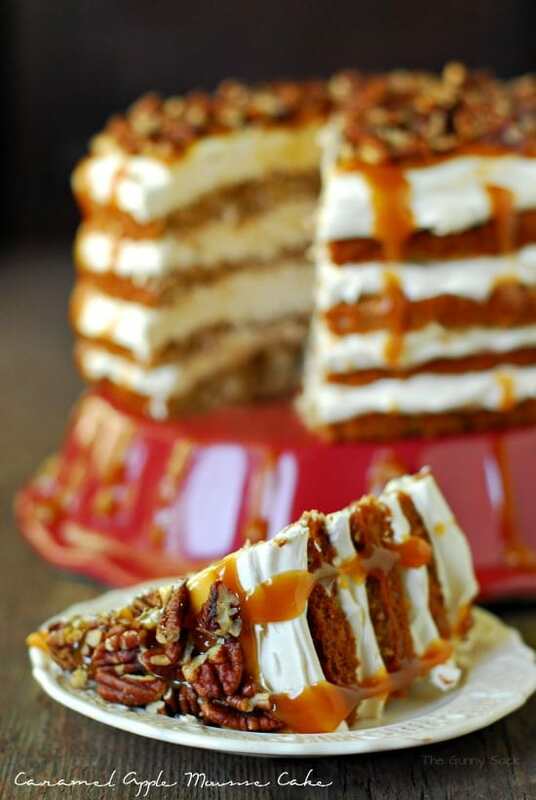 What a gorgeous fall dessert! I think the season is all about deep, comforting flavours and your mousse cake is exactly that! Thanks so much for sharing, can’t wait to try it. 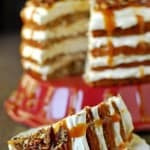 Hi I have been following your blog for a while now and find some of the recipes frustrating because I live in Australia and we do not have cool whip, caramel dip or spice cake mix here. It would be really useful if you could have a sidebar for substitutes of your ingredients for all of your international followers. 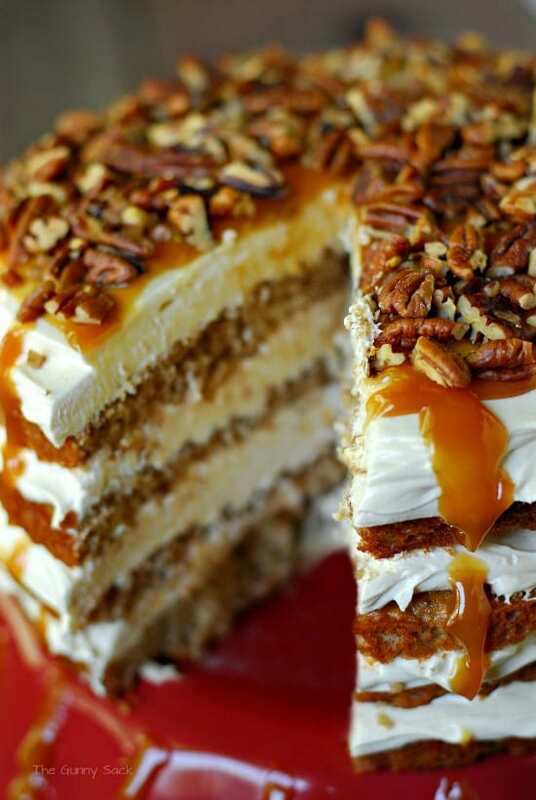 I scrolled down and read the comments in regards to the spice cake substitute and using whipped cream instead of cool whip but what can I use instead of the caramel dip? 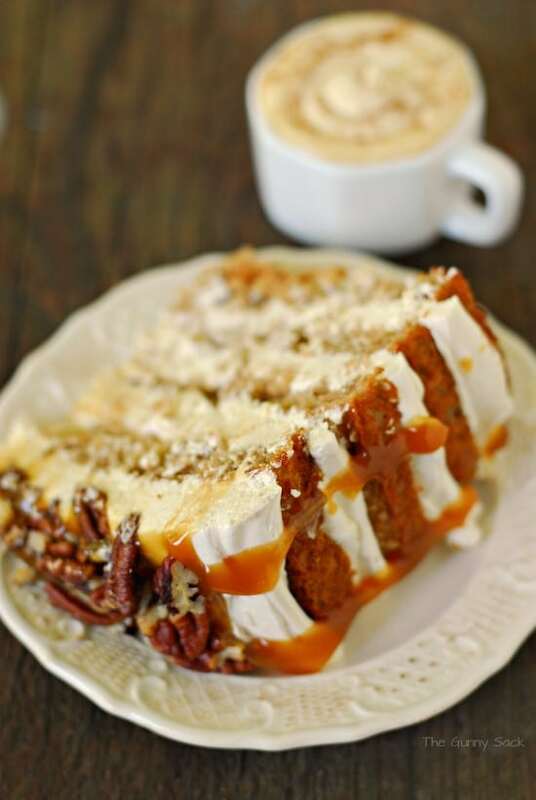 Why not find a recipe for home made spice cake…would probably be even better. You can make Carmel dip it’s super easy. Heat sugar over medium heat until thick brown/amber color.. careful not to burn. Allow to boil for 1 min, it will rise in pan. Remove from heat and stir in 1tsp salt.. allow to cool before using! Keep in a jar with lid..
Hope this helps it’s delicious and can be used for alot of Carmel recipes since you don’t have it there!! Enjoy! !